Grey Brothers, associate professor of music, will present “The Polyphonic Passion in Mexico City: A Lecture-Recital Featuring the Passio Secundum Mattheum of Antonio Rodríguez de Matta (?-1643)” in April at the annual conference of the Society for Seventeenth-Century Music in La Jolla, Calif., with the Westmont Chamber Singers performing under his direction. 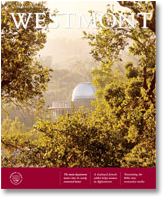 He conducted the Choral Masterworks Concert by the Westmont College Choir in March. Steve Butler, associate professor of music, received an ASCAP award for his achievements in concert music. His accomplishments include the performance of his composition “Grace” by a 58-piece orchestra, 20-voice children’s choir, 48-voice adult choir, and four soloists. He also composed “Zoom,” a multitracked digital piece for computer and synthesized sound, for the 2002 Prix Ars Electronica Festival. His works “Peace” and “Rejoice” were performed in 2002 as well. Deborah Dunn, associate professor of communication studies, is on sabbatical. As part of a research project on organizational change in a post-conflict, sectarian society, she spent a month in Belfast last fall doing a case study of an organization trying to change its culture to become more open and inclusive. During his spring semester sabbatical, Steve Hodson, professor of music, will spend two weeks visiting the music departments at two Minnesota colleges (Concordia and St. Olaf) to study their choral programs and set goals for choral music at Westmont. He was in charge of exhibits, exhibitors and Web pages for the Western Division convention of the American Choral Directors Association (ACDA) in Las Vegas in February. He is vice president of the association and was active as a clinician and adjudicator. He will serve as featured clinician for Grand Canyon University’s annual choral festival in March. He will also adjudicate the Oregon State High School Choral Championships in May and will serve as a clinician/adjudicator for four Heritage Festival events during the spring. Chris Hoeckley, director of the Institute for the Liberal Arts, edited the collected papers of the third annual Conversation on the Liberal Arts. In October, he delivered a paper, “Liberal Arts Traditions and Christian Higher Education,” at The Schooled Heart, a conference organized by the Institute for Faith and Learning at Baylor University. He took part in a panel presentation, “Advancing the Liberal Arts in Graduate and Undergraduate Education” at the annual conference of the Association of American Colleges and Universities in January in Washington, D.C.
Beth Horvath, assistant professor of biology, served as the naturalist for a travel/ study tour to Baja California and the Sea of Cortez in February sponsored by the Santa Barbara Museum of Natural History and the travel group Searcher. Kim Kihlstrom, assistant professor of computer science, published a paper, “The Architecture of the Starfish System: Mapping the Survivability Space,” in the proceedings of the 15th IASTED Conference on Parallel and Distributed Computing and Systems. 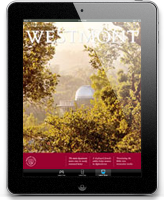 Co-authors include three Westmont students: Chris Phillips, Chris Ritchey and Ben LaBarbera. Kihlstrom coached a team of computer science students that participated in the ACM Southern California Region Programming Contest in Riverside. David Lawrence, professor of political science, has completed a brief edition of his textbook, “California: The Politics of Diversity” (2004) as well as a textbook supplement, “The California Governor Recall Election” (2004). In October, he chaired a panel on Civic Education in Eastern Europe at the International Conference on Civic Education Research in New Orleans. Tremper Longman III, Robert Gundry professor of religious studies, contributed “Israelite Genres in their Ancient Near Eastern Context” to “The Changing Face of Form Criticism for the Twenty-First Century,” (Eerdmans, 2003). He co-wrote “A Biblical History of Israel” (John Knox/ Westminster Press, 2003). He also completed the third updated edition of “The Old Testament Commentary Guide” (Baker, 2003). He wrote “The Family in Wisdom Literature,” for “Family in the Bible” (Baker Books, 2003). In September he gave a talk in Singapore, “God and the Gods in the Poetic Literature,” at the Ichthus Symposium held at Singapore Bible College. Bruce McKeown, professor of political science, presented a paper, “Perspectives on Church-State Relations,” at the 19th Annual Conference of the International Society for the Scientific Study of Subjectivity in October at Kent State University. Aubrey Westfall ’04, a Westmont political science major, co-authored the paper. TechKnowledge Point (TKP), a company founded by David Newton, professor of entrepreneurial finance, and its strategic partner, Entrepreneur magazine, are publishing the second annual rankings of the top 100 collegiate entrepreneurship programs in the United States. The database includes 1,100 colleges and universities and more than 3,000 faculty profiles. The company has compiled a fee-based searchable database of more than 500 entrepreneurship programs that will debut in March at www.entrepoint.com. In August, TKP launched the SEED (Spirit of Entrepreneur-ship and Enterprise Development) national collegiate business plan competition. The eight semifinalists came to Santa Barbara in February for the national competition, co-sponsored by Westmont. Newton is the business financing expert for the fourth year for www.entrepreneur.com and writes a monthly column. In September, Susan Penksa, associate professor of political science, attended the opening of the Srebrenica memorial in Bosnia and Herzegovina (along with Amy Meyer, a Westmont alumna). Former President Clinton was one of the guest speakers. The memorial honors the 8,000 victims of the July 1995 genocide carried out by Bosnian Serbs. She was invited to participate at a political conference in Sarajevo in September, “Building Europe — Enlargement Today and Tomorrow,” co-sponsored by the Konrad Adenauer Foundation and the Delegation of the European Commission to Bosnia and Herzegovina. She co-authored an article, “EU Security Cooperation and the Transatlantic Relationship,” for the September 2003 edition of Cooperation and Conflict. A new body of work by Susan Savage, associate professor of art and chair of the art department, focused on a simple silver bowl. “Bearing Witness: Recent Paintings by Susan Savage” was on exhibit Feb. 2 through March 5 in Westmont’s Reynolds Gallery. Greg Spencer, professor of communication studies, spoke in chapel in September on “The Slaughter of Innocence: What Herod and Hollywood Have in Common.” In November, he presented a paper, “The Rhetoric of Innocence in Film: Stories of Loss and Redemption,” at the Lilly Conference, The Narratable World, in Seattle. Paul Willis, professor of English, contributed an essay, “Spokane: A Triptych” to the fall 2003 issue of Image: A Journal of the Arts and Religion. He will give poetry readings at Elizabethtown College in Pennsylvania in March and at Calvin College in Michigan in April.